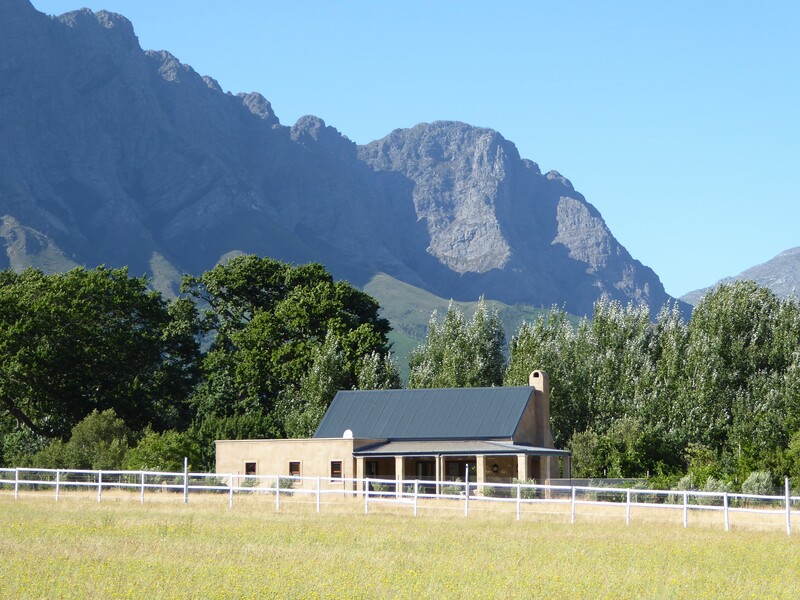 Luxury self-catering farm cottage with far reaching mountain views. 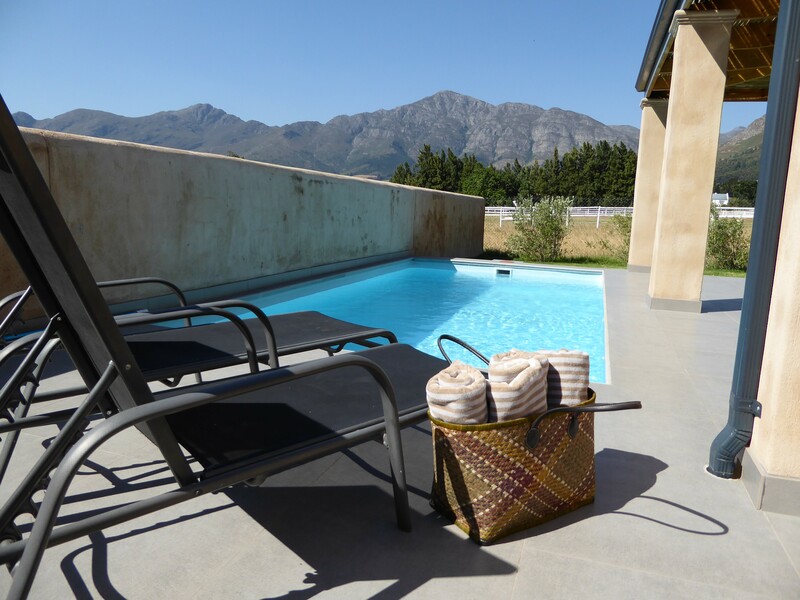 Own heated pool, exclusively for two sharing. Fully airconditioned. Free WlFi. 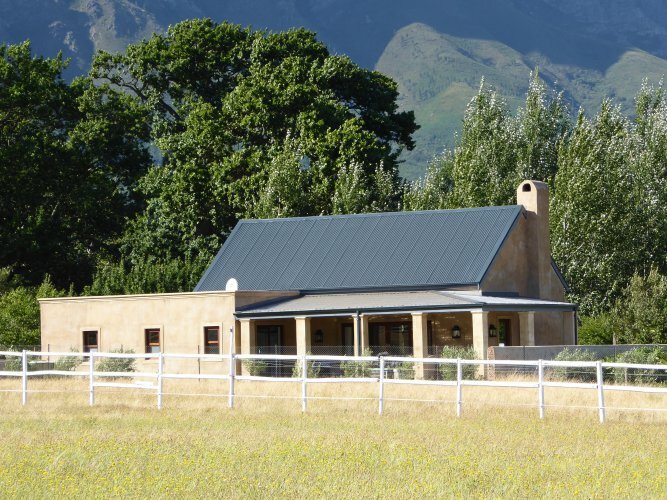 Saddlebrook Farm is situated in an enviable position in the centre of the beautiful Franschhoek Valley surrounded by paddocks and vineyards with far reaching mountain views on all sides. 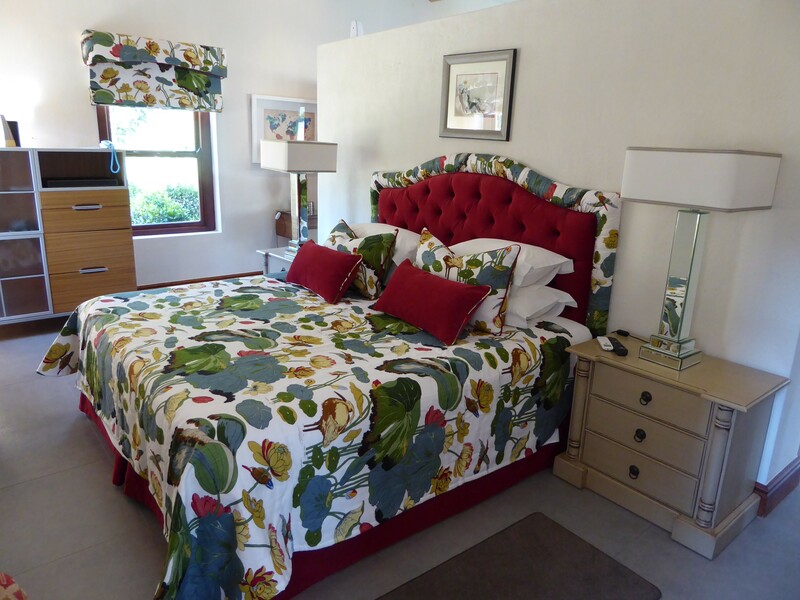 Saddlebrook Cottage is exclusively for a couple. It is situated on a stand alone plot surrounded by a walled garden offering total privacy and seclusion whilst enjoying total luxury. 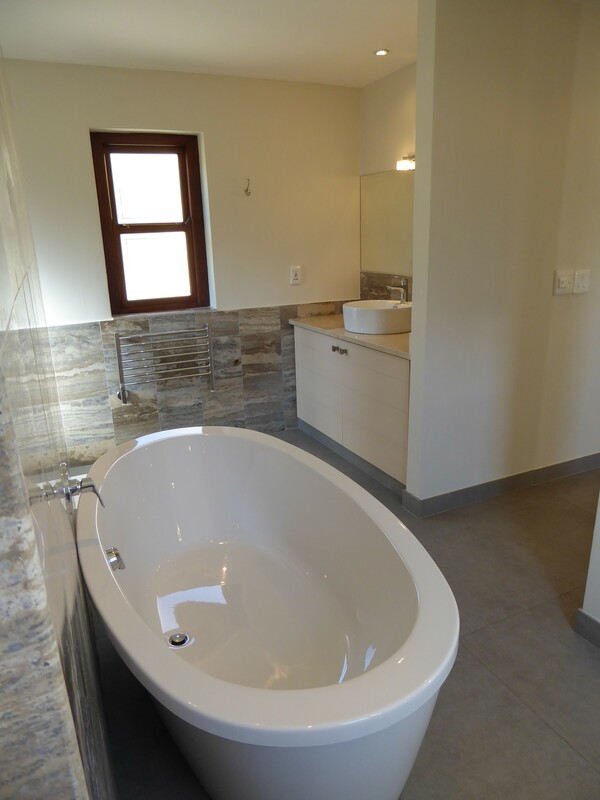 There is a large sitting / dining room, fully fitted kitchen, bedroom with king size double bed, dressing room and marble bathroom with generous shower, free standing bath, and his and her vanities. 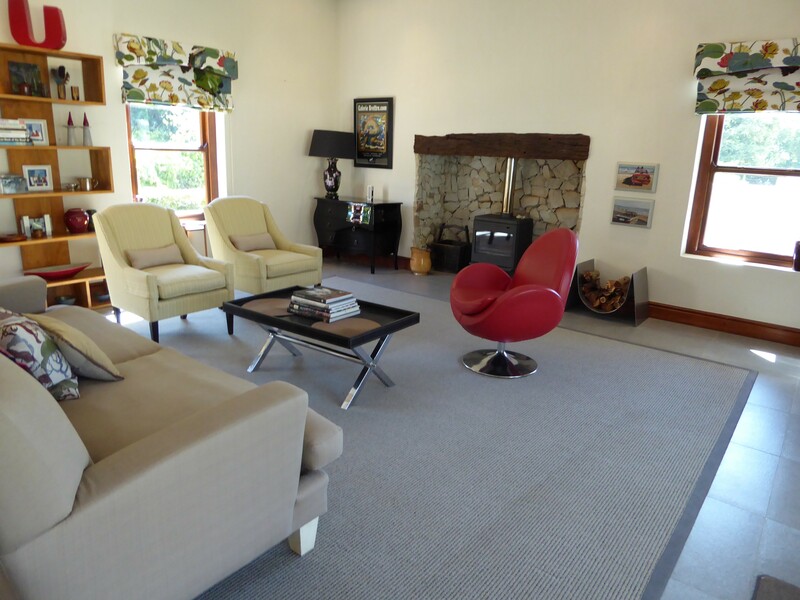 Double doors from the sitting room open onto a large covered veranda with easy chairs, coffee table and dining table The cottage has its own heated swimming pool, with an open patio and sun loungers. 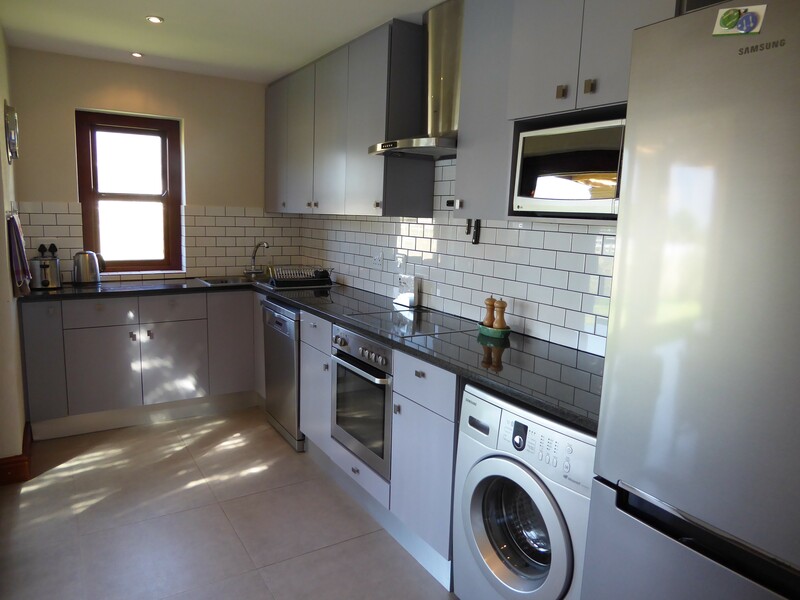 The cottage is fully air conditioned with under floor heating to the bathroom and a log burner for winter. The stylish decor is contemporary country house, which contributes to a relaxed cosy, yet sophisticated feel, with supreme comfort uppermost. Original artworks, antiques & fabrics by Colefax and Fowler and G.P.& J Baker. 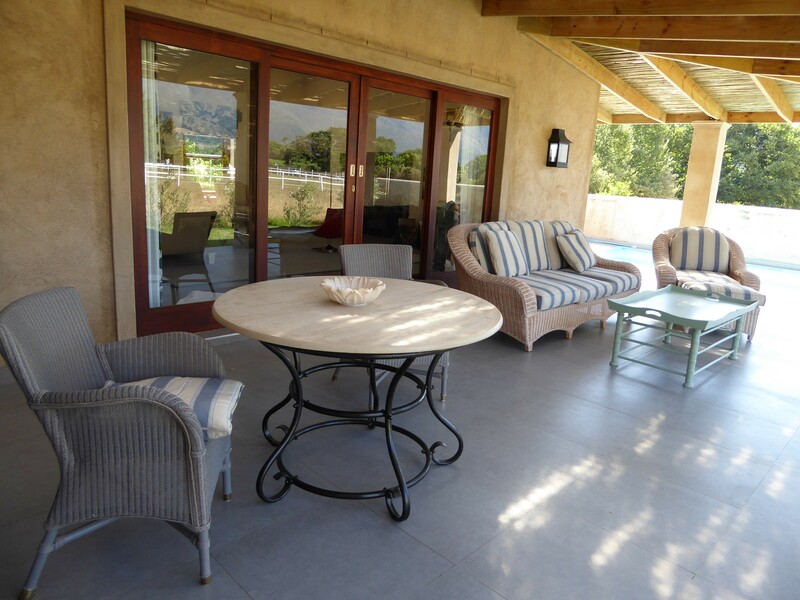 The farm is just a couple of minutes drive or a short walk from the hustle and bustle of the vibrant village of Franschhoek, where you will find award winning restaurants, galleries and speciality shops of all kinds. The highly acclaimed Cafe Bon Bon restaurant is just a 2 minutes walk from the cottage; this is open daily for breakfast and lunch and is open three nights a week for dinner (Wednesday Friday & Saturday). Other restaurants are also nearby. The cottage is serviced daily. Free WiFi; Televisions with DVD in bedroom and sitting room; selction of Dstv channels including BBC world news.